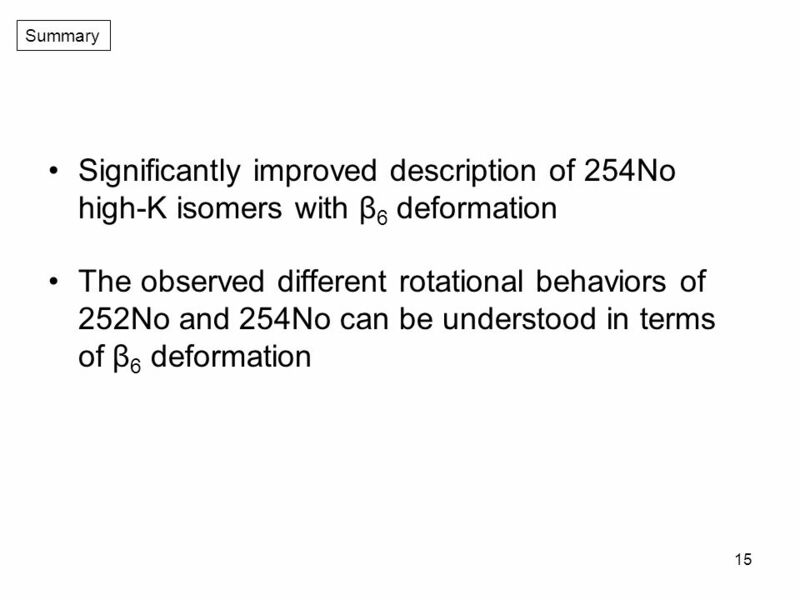 1 Effects of high-order deformation on high-spin structure in the heaviest nuclei accessible by spectroscopy experiments 2012 8. 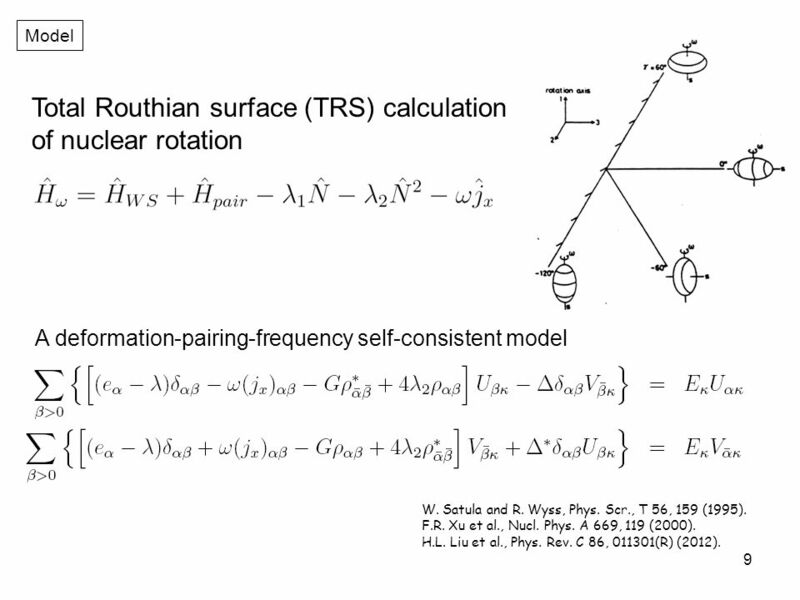 8 8 Model Configuration-constrained calculations of potential-energy surfaces F.R. 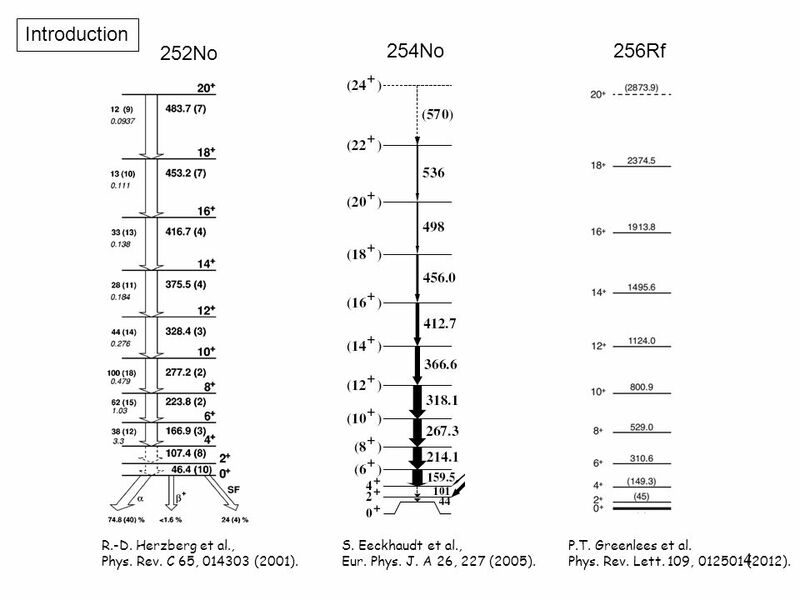 Xu et al., Phys. Lett. B 435, 257 (1998). 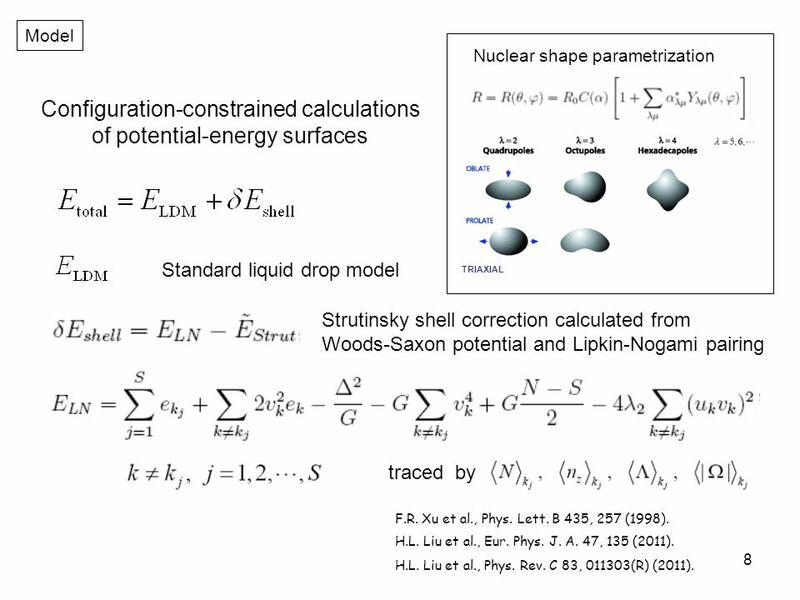 Standard liquid drop model Strutinsky shell correction calculated from Woods-Saxon potential and Lipkin-Nogami pairing traced by Nuclear shape parametrization TRIAXIAL H.L. 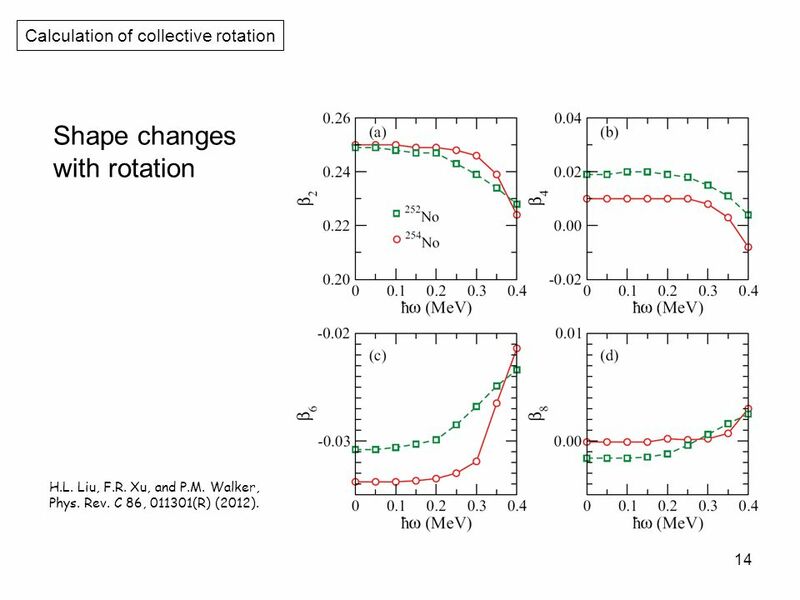 Liu et al., Phys. Rev. C 83, 011303(R) (2011). H.L. 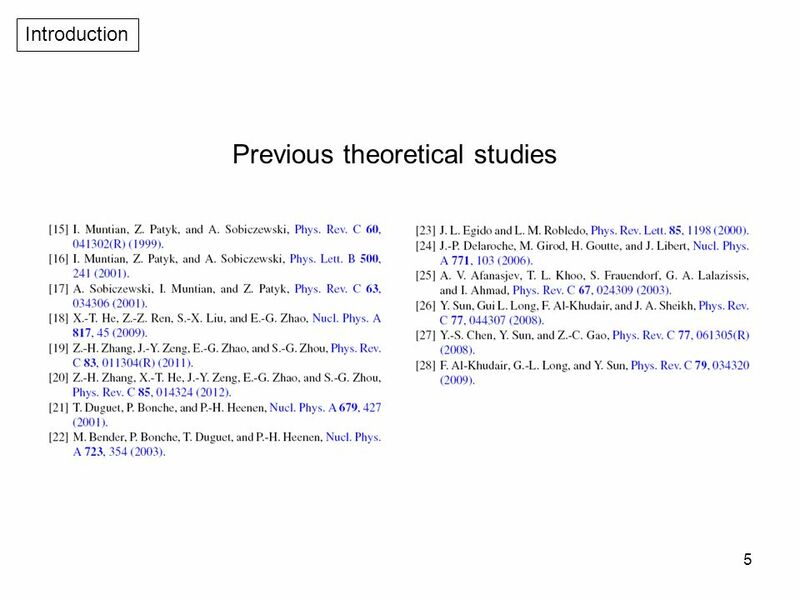 Liu et al., Eur. Phys. J. A. 47, 135 (2011). 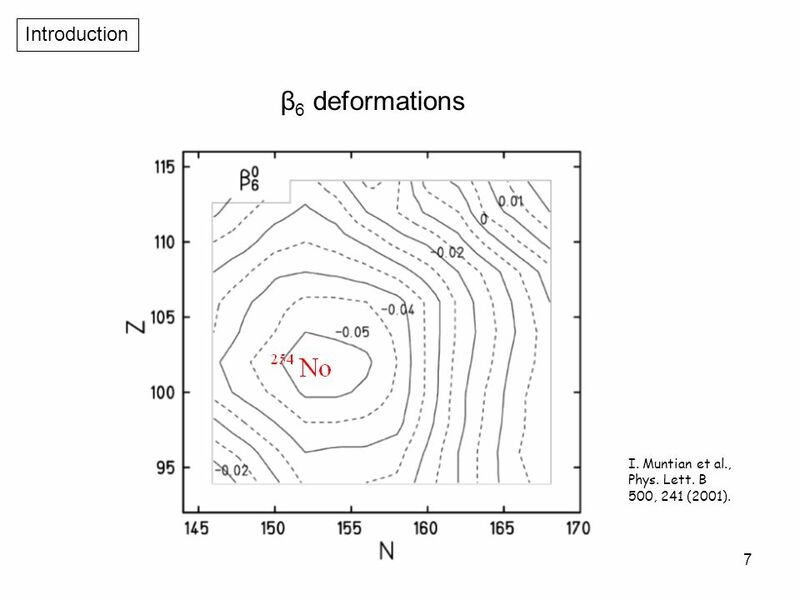 9 9 Model Total Routhian surface (TRS) calculation of nuclear rotation A deformation-pairing-frequency self-consistent model W. Satula and R. Wyss, Phys. Scr., T 56, 159 (1995). F.R. 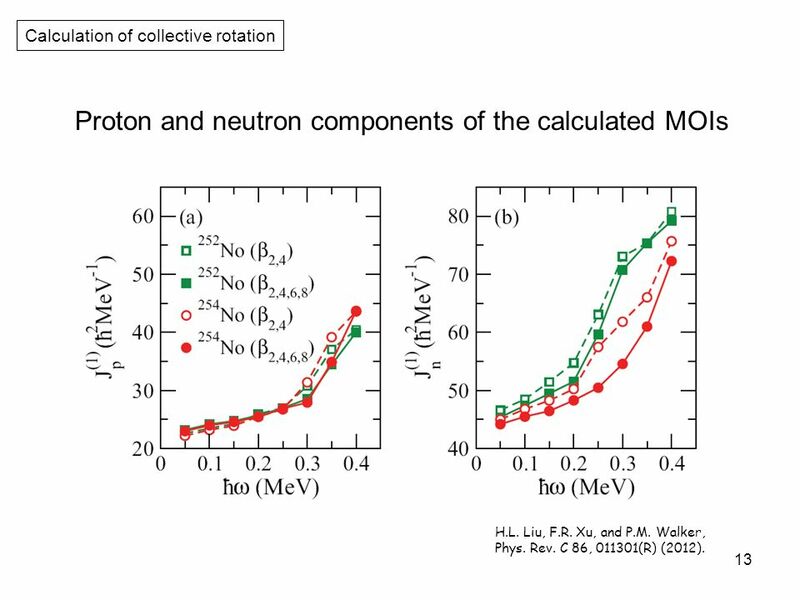 Xu et al., Nucl. Phys. A 669, 119 (2000). H.L. 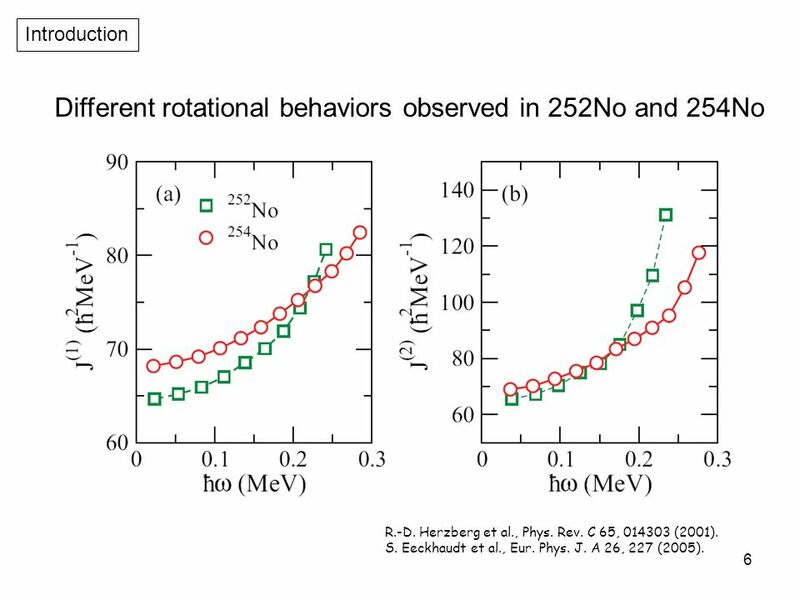 Liu et al., Phys. Rev. C 86, 011301(R) (2012). 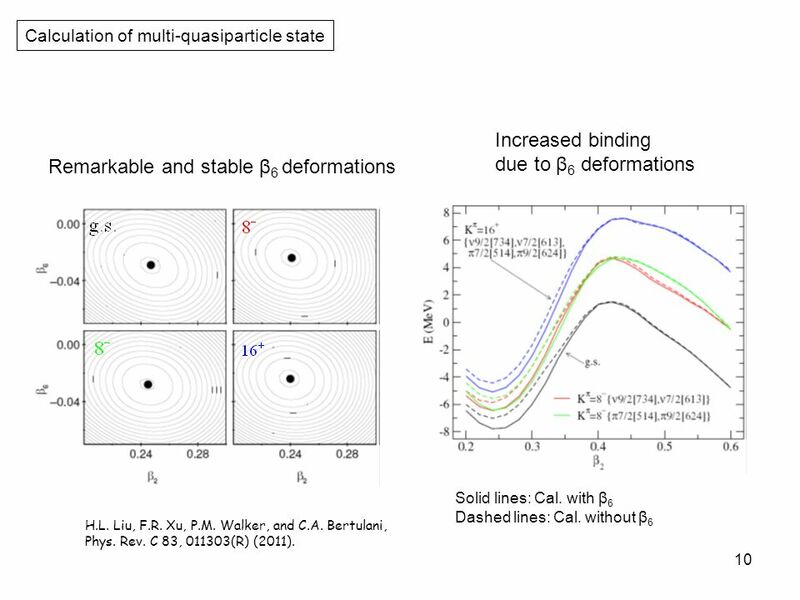 10 10 Remarkable and stable β 6 deformations Increased binding due to β 6 deformations Solid lines: Cal. with β 6 Dashed lines: Cal. 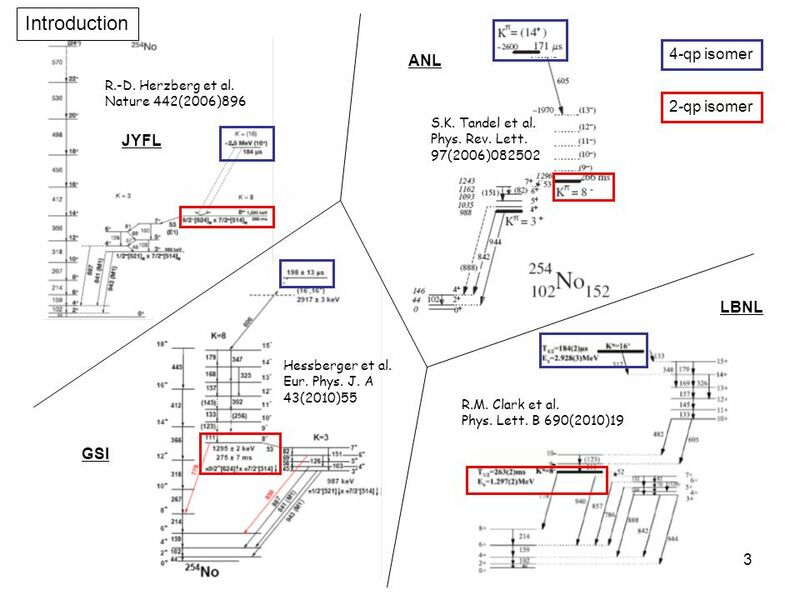 without β 6 Calculation of multi-quasiparticle state H.L. Liu, F.R. Xu, P.M. Walker, and C.A. 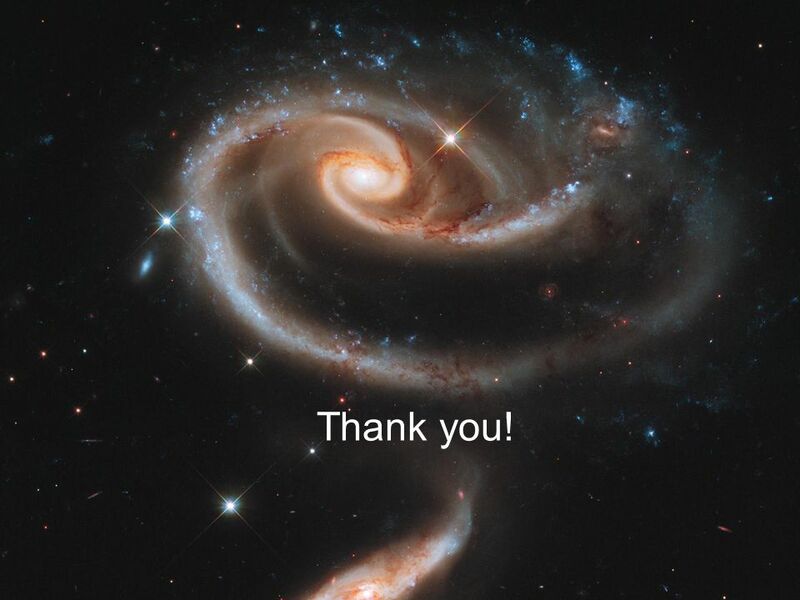 Bertulani, Phys. Rev. C 83, 011303(R) (2011). 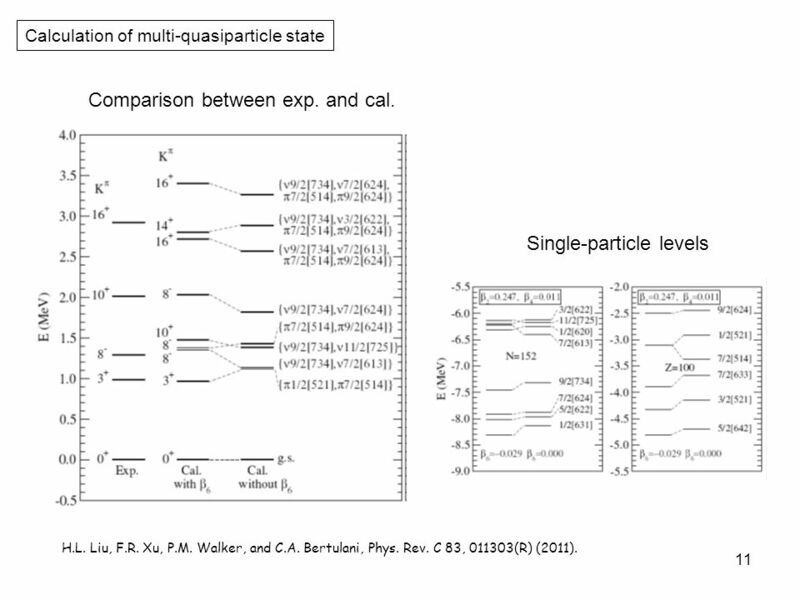 11 11 Calculation of multi-quasiparticle state Comparison between exp. and cal. Single-particle levels H.L. Liu, F.R. Xu, P.M. Walker, and C.A. Bertulani, Phys. Rev. C 83, 011303(R) (2011). 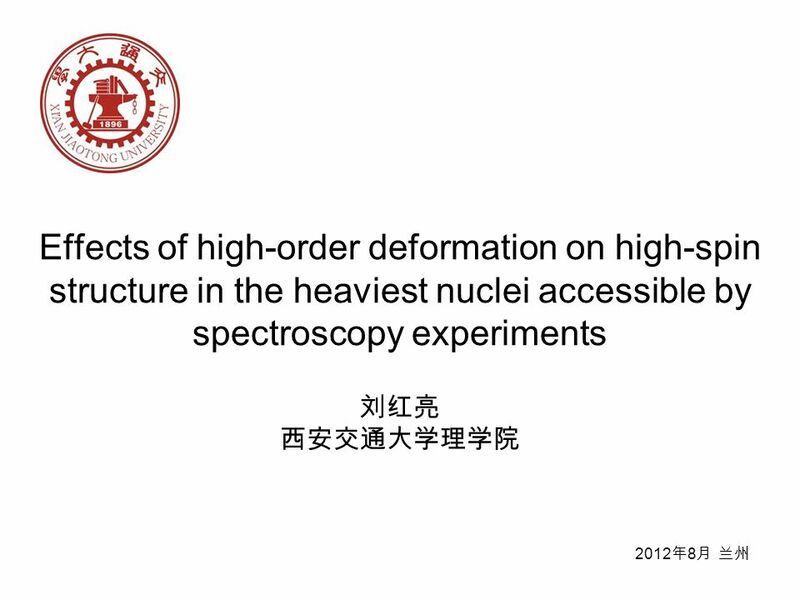 Download ppt "1 Effects of high-order deformation on high-spin structure in the heaviest nuclei accessible by spectroscopy experiments 2012 8." 基于热核退激的路径分析 对核耗散的研究 毛英臣 辽宁师范大学物理学院 2012超重核合成与性质讨论会, 兰州大学, 2012年8月. 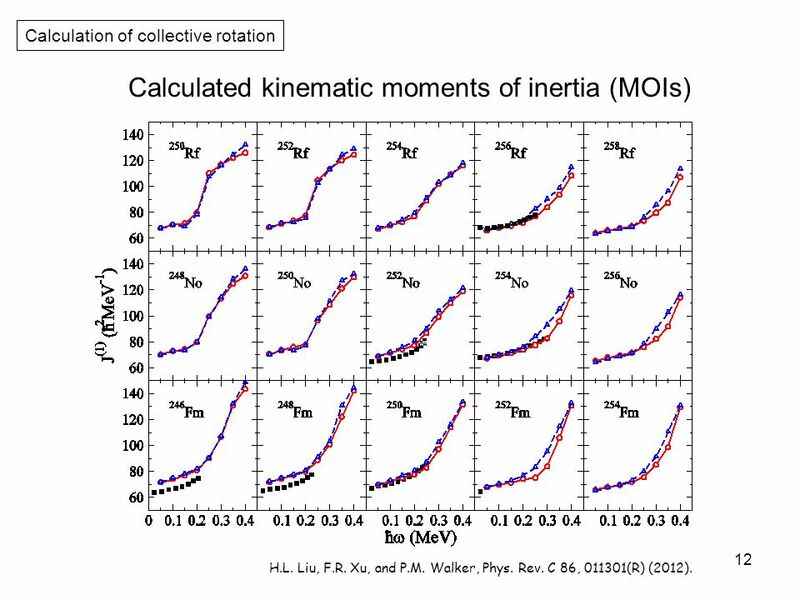 1CEA/DAM/DIF/DPTA/SPN Workshop ESNT, Saclay, june 28- july Giant resonances and inertia parameters Within the QRPA with the Gogny force in axial. 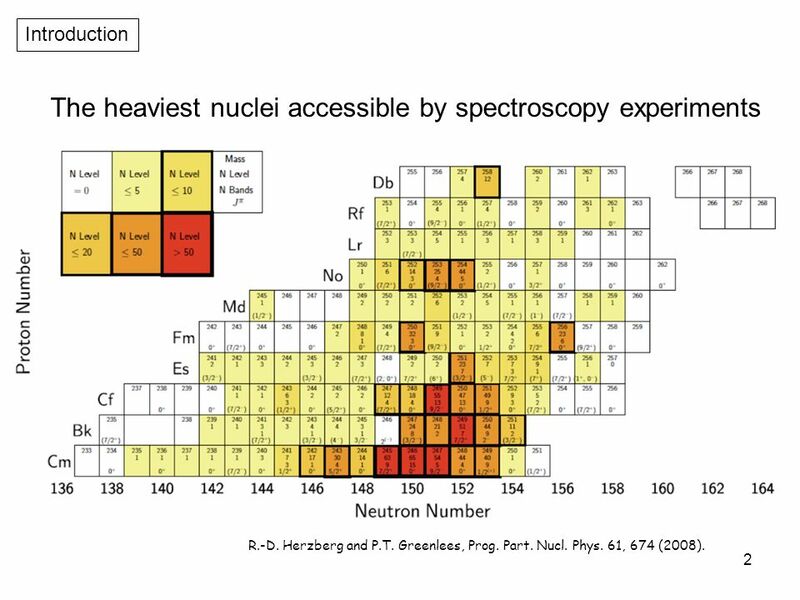 The excitation and decay of nuclear isomers Phil Walker CERN and University of Surrey, UK 3. Isomers at the limits of stability ● p decay ● n decay ● α.